Comprehensive Custom – STJ Orthotic Services, Inc.
Our Comprehensive Custom orthotic line is unsurpassed in quality and workmanship, providing the full spectrum of choices and designs. Orthotic types include Maximum Control, Mid Range, Accommodative, Applied Sports, Fashion & Dress and Specialty. Our custom made devices can be fabricated from plaster, cast foam or scanned negative models. We have provided a product listing for each of our orthotic types. STJ Unit: Exclusive! Laminated thermoplastic unibody rearfoot design with plantar grind and intrinsic forefoot posts. Vinyl top cover to met length. Firm control. Graphite Semi: Low bulk graphite composite shell of Carboplast or TL Blue. 70 durometer extrinsic rearfoot posts. Vinyl top cover to met length. Rigid control. (TL Blue shown here). Graphite Rigid: Carboplast graphite composite shell. 70 durometer extrinsic rearfoot posts. Vinyl top cover to met length. Extra rigid control. 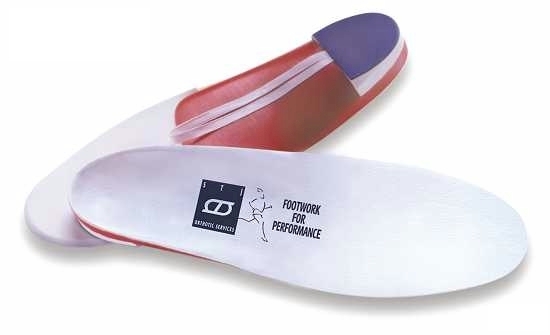 Aerobic: Thin shell, EVA arch reinforcement, rearfoot intrinsically balanced. 1/16" poron extension and vinyl top cover to full length. Semi Firm flexibility. Basketball: Semi-rigid shell, 55 durometer extrinsic rearfoot posts, poron arch reinforcement. 1/8" poron & suede bottom cover to full length. Vinyl top. Cycling: Low bulk Carboplast graphite composite shell, intrinsic rearfoot & extrinsic forefoot posts to sulcus. Vinyl cover to sulcus length. Rigid control. Golf: Thin shell, poron arch reinforcement with 1/16" bottom cover, rearfoot intrinsically balanced. 1/8" poron extension and vinyl to full length. Semi-flexible. Porowalker: Semi-flexible shell, poron arch reinforcement, rearfoot balanced. "Wing" style cut out. 1/16" poron top cover and vinyl to sulcus length. Sprinter: Semi-flexible shell, 55 durometer extrinsic rearfoot posts, poron arch reinforcement. 1/16" poron extension and vinyl to full length. Semi-flexible. STJ 26.2: Semi-rigid shell, 55 durometer extrinsic rearfoot & Forefoot posts to sulcus. Vinyl cover to sulcus length. Semi-rigid for long distance running. Ski: Semi-rigid shell, 55 durometer extrinsic rearfoot posts & pull tabs. 1/8" foot forming Pelite extension and vinyl to full length. Semi-rigid. Tennis: Semi-rigid shell, 55 durometer extrinsic rearfoot posts, 1/8" poron extension and suede bottom cover to full length. Vinyl top cover. Semi-Rigid. Suboflex: Semi-rigid shell, 55 durometer extrinsic rearfoot posts. 1/16" poron top cover and vinyl to full length. Semi-firm control. Plantar grind design available. Poroflex 3&4: Semi-rigid 3 or 4mm flexibility shell. Poron arch reinforcement, rearfoot intrinsic balanced. 1/16" poron top cover and vinyl to full length. Semi-firm to firm flexibility. UCBL: Semi-rigid shell, 70 durometer extrinsic rearfoot posts, extra deep heel cup, medial and lateral flanges. Vinyl top cover to met length. Semi-rigid shell, extrinsic rearfoot posts, gait extension to induce out toe or in toe. Vinyl cover to met length. Semi-rigid shell, extra deep heel cup and flexible rearfoot post construction. 1/16" heel cushion and vinyl to met length. Subo-lite: Semi-rigid shell, intrinsic rearfoot & forefoot posts. "Plantar Grind" design. 1/16" poron extension and vinyl to sulcus length. For low or flat heels. Graphite-dress: Low bulk Carboplast graphite composite shell. Intrinsic rearfoot & forefoot posts. 1/16" poron extension and vinyl to sulcus length. Narrow design, for low to flat heels. Poroflex 2: Thin, 2mm flexibility shell. Poron arch reinforcement, rearfoot intrinsically balanced. 1/16" poron top cover and vinyl to full length. Semi-flexible. Graphite-lite: Low bulk Carboplast graphite composite shell. Intrinsic rearfoot & forefoot posts flat heel cup. 1/16" poron extension and vinyl to sulcus length. Narrow design, for low to medium heels. Poroflex 1: Ultra thin, 1mm flexibility shell. Poron arch reinforcement, rearfoot intrinsically balanced. 1/8" poron top cover and vinyl to full length. Extra flexible. EVA & EVA Zote Mould: All EVA or EVA & Plastazote laminate shell. Pink Plastazote and Cambrelle top cover to full length. Soft flexible and foot forming. (All EVA Mould shown here). Rigid Zote Mould: Rigid black Plastazote shell. 1/8" poron top cover and vinyl to full length. Lightweight and rigid. A) Poron: Poron filler, 1/16 poron bottom cover, leather cover to full length. Flexible. B) Laminate: - Leather laminate filler, leather cover to full length. Medium. C) Cork: - Cork filler, leather cover to full length. Semi-rigid. D) Subo: - Subortholen & Cork filler, leather cover to full length. Rigid.